Ordering a charcuterie board always makes me feel so fancy, especially when enjoyed with a glass of wine. I’ve always wanted to make my own charcuterie at home, but have to admit it always seemed a little intimidating. However, after building the courage to assemble one on my own (most of the inspo came from this marble slab I found at TJ Maxx for only $8! Such a steal right?! It was originally $54! ), I’m happy to report that it’s super easy, and I’m going to show you how to build one like a boss! What’s so great about a charcuterie board is that there’s absolutely zero cooking involved which is even better on the days where you’re entertaining a crowd. To get started you’ll need a few things…. A variety of meats and cheeses. You’ll need an assortment of mild, medium, and bold flavors. Some spicy, some with herbs, some sliced think, some thin. In this board I went with sopressata and salami for the meats. For the cheeses…brie, burrata, parmesan, and cheddar. Seasonal Fruit. I LOVE a charcuterie that’s got an assortment of fruits, specifically berries. It’s nice to add some sweetness to the mix. Spreads, Perserves, and Jams. Some of my favorite spreads to add to a charcuterie board are stone ground mustard, hummus, and tapenades. I’m also a fan of including jams; on this board I included raspberry jam. Something briny. For this I almost always turn to olives! Pickled jalapenos and pickles are also great because they pair with the meat so well. My green olives on this board were stuffed with roasted garlic. ? Crackers and bread. Get an assortment of crackers. Water crackers are best and they can be plain or flavored. If you’re feeling fancy throw some grilled bread on there too! Alcohol. Wine! and beer are what you want to pair with your charcuterie. You can either go with white or red. I like to go with white most of the time. 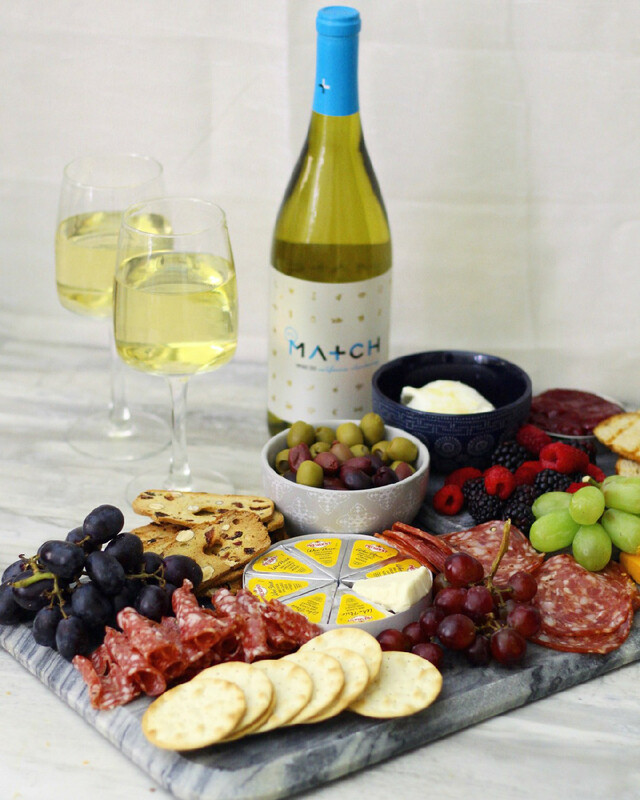 For all my charcuterie needs, I teamed up again with one of my favorite grocery stores Grocery Outlet! 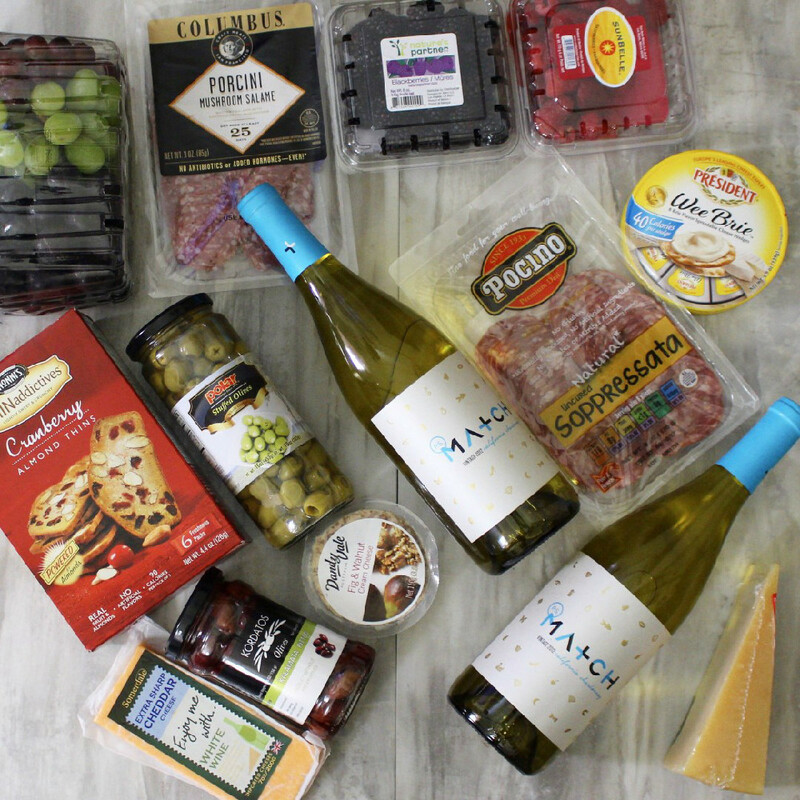 If you’re new to the blog then let me introduce you to this hidden gem that has some of the best wine sales and an awesome selection of food at 40-70% less than most grocery stores. I kicked off the beginning of the new year with 3 healthy and affordable meals form Grocery Outlet, and their wine sales have been great in my Strawberry Basil Sangria and Ginger Peach Sangria. One of my favorite aisles, the “NOSH department”, which stands for “Natural, Organic, Specialty, Health is my go to for a lot of the products I use on a daily basis, like coconut oil! Also you can’t beat their wine sales, and I’m almost always grabbing a bottle of wine with my groceries! After you’ve gotten all the ingredients for the charcuterie board, assembling it is rather easy. You’re going to want to get creative with the spread, and I like to use small bowls to add some height to the platter and some separation between ingredients. Arrange it however it’s aesthetically pleasing to you. I also like to look at pictures on the internet for inspo.